What’s this? A post on a weekend? I know, I know. Crazy. But I created this recipe on Thursday night and had to share. It stemmed from a major craving for cookies. Actually cookie dough. I thought about making a batch of Supercharge Me Cookies from Eat, Drink and Be Vegan… but we were out of maple syrup and I wanted to use up a few bananas in the fridge. Soooo, this recipe was born. And the dough is delicious. 2. 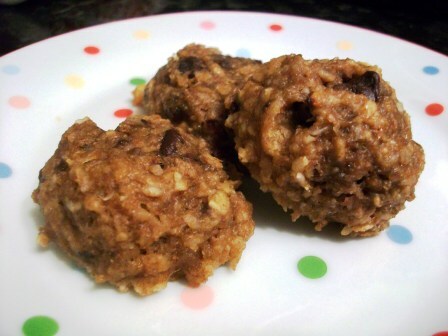 In a large bowl, combine oats, flour, salt, cinnamon, coconut and baking powder. Stir well. 3. In another bowl, stir together bananas, brown sugar, oil and vanilla. 4. Add banana mixture to flour mixture and stir to combine. Do not overmix. Stir in raisins and chocolate chips. 5. On a greased cookie sheet, scoop out dough in small mounds (I used a 2 oz ice cream scoop). Bake for 12-14 minutes. They’ll maintain the rounded shape- so don’t worry when the cookies don’t spread. The cookies are SUPER moist, thanks to the bananas. Although the ones I baked weren’t, it wouldn’t be hard to “veganize” the recipe- just sub in vegan chocolate chips. This entry was posted in April 2010 and tagged baking, Cookies, Recipes, Vegan. Bookmark the permalink. Oooh… I have to bring dessert to a potluck tonight and this could be the winning recipe! Looks pretty easy AND I have all of the ingredients already. Yum! Oh yum, these look great. Thanks for posting the recipe!